I was recently offered a body pillow set from Tree Hugger Pillows to review, and the timing couldn’t be better. With my wife 5 months pregnant, a body pillow is a comfort she couldn’t resist. This got me thinking though- what makes a pillow eco-friendly? It’s all about the fill. Even though I hadn’t heard of it until recently, Kapok fiber has been around for sometime providing loft in many things from automobile seats to nautical flotation devices until replaced by synthetic fibers. From the Kapok tree (Ceiba pentandra), native to Mexico, Central America and the Caribbean, northern South America, and tropical west Africa; it is also cultured commercially in southeast Asia, particularly in Java. 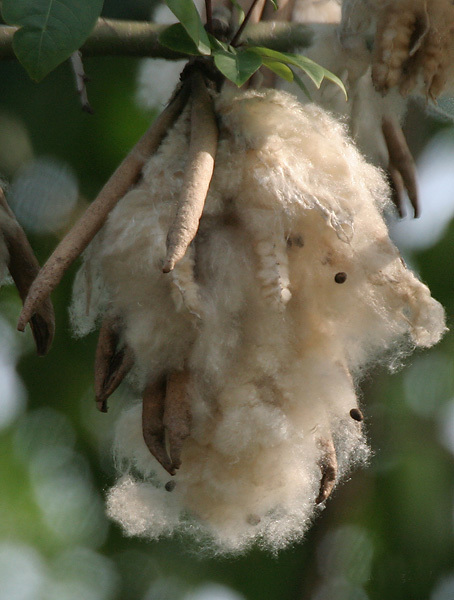 The Kapok tree produces several hundred 6 inch pods containing seeds surrounded by a fluffy, yellowish fiber that is light, very buoyant, resilient, and resistant to water. Kapok fiber is not only a great natural material, it is also hypoallergenic, sustainable, biodegradable, nontoxic, and grown pesticide-free. The feel is somewhere between silk and cotton but stays lofted for years unlike down or foam and breathes superbly. 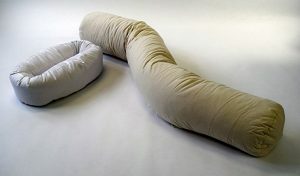 The pillow set I received (pictured here) was the Large Sleep Set which included a long cylindrical pillow accompanied by a smaller rounded pillow perfect for your head, or used between the knees to keep your hips aligned. This is how my wife was using it for her first trimester until switching to the full length body pillow in her second trimester. We love that the long pillow is is so versatile, allowing for neck and hip support when shaped around the back or knees, shoulders and neck when held from the front. While compressing comfortably under the weight of the head or body, the pillow stays lofted and doesn’t ‘bottom out’ or become lumpy. It has contributed to many nights of very comfortable sleep, and often migrates into our living room for lounging on the couch or floor. Tree Hugger Pillows offers a variety of pillow shapes and sizes, all handmade in the USA with natural Kapok filling.